This may sound simple to some but I've only started doing this recently and it's made life so much easier when I'm taking photos. I used to struggle with products that weren't flat because they always used to roll around and, thankfully, I don't have that problem anymore! Bluetack is such an easy solution and no one can tell that you've used it. If any of you follow my blog on Twitter, you may know that I occasionally (more like frequently) freak out about HTML - I have absolutely no idea how most of it works. In the past, I accidentally deleted a section of my HTML and didn't know how to reverse the issue. Luckily, I had a version of my HTML saved so I could insert the section in that I needed. I wouldn't have known what to do if I didn't have this. I recommend, if you aren't confident with HTML and you are going to be altering parts, to save the untouched version beforehand so you have a backup incase anything goes wrong. Personally, I love different forms of media so by having a photo as well as text it makes me more intrigued about the post. I know that many people believe in this too, it's just something interesting to look at and can give you a good idea about the general message of a post. If you're worried that your blog doesn't fit into a specific category, it doesn't matter, as I know for many people their blog is a mixture of everything and that 'everything' is a representation of them. I know that personally I couldn't label my blog as just 'lifestyle'; there are so many more aspects of my blog and it can't just fit into one category. I've learnt that it's okay to not fit a certain 'title'. If you have found a niche, that's great, this is just for people that are worried about finding one because I believe that it doesn't hold the upmost importance in the success of a blog. 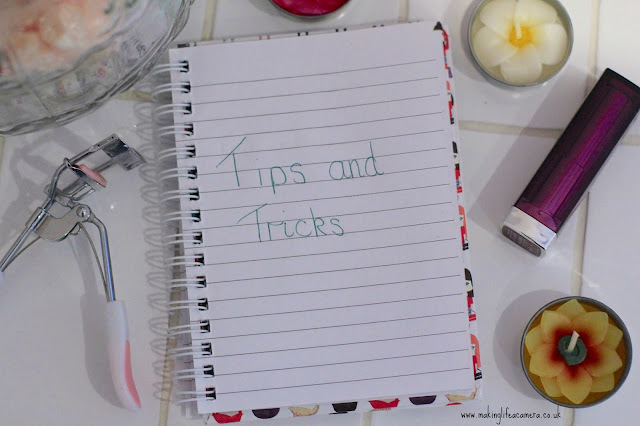 Have you got any other tips and tricks that I haven't mentioned? I'd love to know! I tried to fit my blog into a niche a while ago, but I love writing about so many different things that I just gave up. There's no point in trying to restrict creativity! I'm definitely going to start using BluTac in flat lays now, thanks for the tip! That's really true, it's hard to stick to a certain area! That's alright, hope it makes taking flat lays a bit easier! Thank you! Backing it up has helped a lot! Same, I enjoy so many different things and my blog can't just be put into one category!